Now that I’ve seen belt drive in action on a couple of “city bikes” in town, I can’t seem to let this one go. On an upright bike, belt drive is smooth, reliable, light, and silent. On a recumbent it has the potential to solve what for many is their bane: a long, greasy, noisy, unwieldy chain. This post is my attempt at taking a closer look to see what might be preventing the adoption of belt drive for recumbents and, specifically, ‘bent trikes. I’ll discuss the issues I see, many unique to ‘bents. Then I’ll see if I can figure out what it would take to adapt my current trike to belt drive. I doubt there’s much market for a single speed recumbent. Without an internally geared hub that’s what you’d have because belts can’t tolerate the lateral misalignment and effective length changes inherent in external gears. So the combination of recumbent and belt drive necessarily means IGH. For me that’s a good thing, I’ll probably go IGH even without belt drive if the Alfine 11 works out. But in a segment that already seems slow to adopt IGH, this requirement might be another reason for a trike manufacturer not to go there. And then there’s gear range. In my gearing post it was complicated enough figuring out how to get the range I wanted. It’s even harder with belt drive because the choices for IGH and cog sizes are far narrower. Well, it’s actually easier, but the odds of a successful outcome are less. For example my goal of combining a Schlumpf Speed Drive with the Alfine 11 appears to be a non-starter. Gates is the only belt manufacturer that I know to have product in current production for bikes, and their system requires a relatively high tension to prevent teeth skipping in the cogs. Schlumpf states that such high tension is not compatible with their drives because it causes excessive bearing wear. I don’t know if the Schlumpf and Alfine have drastically different bearing designs, Shimano is just ignoring the problem and so the Alfine may wear poorly with the Gates system, or if Schlumpf is just trying to differentiate their own belt drive system that requires less tension. What to do? One solution is to use the Schlumpf belt drive instead of Gates. Schlumpf states that their drives are compatible with Alfine when using a chain, I don’t know why this wouldn’t also be true with a belt. And it seems they would have to support Shimano IGH if they want their system to be successful. Unfortunately I don’t see much evidence that the Schlumpf belt drive system is much more than an idea at this point. Another possibility is to use a Rohloff hub which provides more range than the Alfine-11 and is compatible with the Gates system. For me, I’d seriously consider living without high gearing if it meant I could add belt drive to my Sprint Di2 trike. Perhaps the biggest challenge with ‘bent belt drive is that in a typical recumbent, the rider’s leg length is directly tied to chain (drive line) length. This is annoying with a chain but nearly a show stopper with a belt. Tension is critical in a belt drive system and they can’t easily take up slack introduced by adjusting the boom length. Common techniques like spring tensioners and chain guides are expressly called out by Gates as not compatible with their system. All is not lost. If you look at an ICE trike, for example, their three-piece frame design provides an obvious way to take up some amount of slack. The rear section of these trikes slides into the cruciform section and is secured with a couple of clamp bolts. There is a certain acceptable range for how far in you can slide these pieces so that the seat mounts properly. In my experience this range is fairly wide and could be made wider with different seat brackets. As it is, it’s certainly wide enough to provide the 12 mm Gates specifies (minus 10 to provide enough slack to install or remove the belt and plus 2 to tension the belt) without resorting to horizontal dropouts like you see on many upright frames. I think with some attention, or maybe even as it is, this feature alone could account for a fair amount of adjustability in leg length. Note that I’d invest in the quick release option for the clamp bolts because changing the rear tire would require cracking these. And there might be need of a more sophisticated way to make fine changes in belt tension. The above sounds promising but seems unlikely to provide a very high range of adjustability. Another technique is to provide some fore-aft adjustability in the seat, like on my wife’s TerraTrike Cruiser. In theory this could completely solve the leg length problem but I think it comes at a fairly high cost—from a handling stability standpoint I don’t think you want to be moving the center of mass around too much. I certainly notice a change in handling when I do this on the Cruiser and it’s perhaps telling that few trike designs seem to do this—most seem to favor the “infinitely adjustable boom.” But maybe a combination of some range of fixed boom lengths (again, like on the Cruiser), seat adjustment, and fine-grained boom adjustment could limit the number of belt lengths required to cover all rider sizes from nearly infinite (i.e. custom) to a manageable number of pre-defined lengths. Competing, non-complementary requirements and design limitations. Finding a middle ground that works is just engineering. But I think it’s safe to say that with belt drive, your ‘bent is going to be more personal than ever. Two holes in frame and four in bracket provide eight seat positions. Boom extends only in pre-defined chunks, using extenders. Most ‘bents require a bend in the drive line to get around the frame, some more than one. The traditional way to do this is with idlers on the drive side and either idlers or a chain guide (ICE uses a chain tube) on the return side. Things are more complicated with belt drive—chain tubes can’t be used for the return line because the belt is under relatively high tension. The typical side-by-side pair of idlers can’t be used because the belt won’t tolerate the lateral misalignment required. Finally, one of the idlers required to “bend” the belt is on the back, smooth side of the belt and effectively bends it “backward.” I’ve not seen anything in the Gates documentation that addresses this and I haven’t seen an example of doing this with the Gates system. I suspect they might take issue with it, even though the belts in my car’s engine do this sort of thing all over the place. The closest thing I’ve seen with Gates is the “snubber” used to increase belt wrap on the rear sprocket of Rohloff hubs. The snubber may be doing something similar to the the I-1 idler in my “Single Belt” diagram below. That is, bending the belt backward on the smooth side. But it’s doing it on the return side, not the drive side like my drawing. And the Gates documentation says the snubber shouldn’t be in contact with the belt, so I guess I don’t understand when it comes into play. Maybe there’s a lot of slack on the return side of the belt? Following is a possible way to route a single belt on my HDQ using the Gates belt drive system. For the sake of this discussion, pretend the rear is not suspended. The I-1 idler would have a smooth surface, much like the stock ICE idler. I imagine the I-2 idler would need to be a Gates cog to avoid damaging the teeth of the belt. The smallest cog I see on the Gates site is 22 teeth which is the diameter I show here. One of the idlers could be adjustable perpendicular to the belt to provide fine-grained control of belt tension. If the idlers in the single belt solution are a show stopper, another option is two belts with a mid drive. The mid drive is a pair of connected cogs at a location on the frame with line-of-sight to both the front and rear cogs. This solves the problem of “bending” the belt but adds two new problems: The mid drive will see greater force than the idlers in the single belt solution and so will have to be made more substantial. And the primary way of compensating for changes in belt length due to leg length adjustments in the front boom, by moving the rear frame relative to the cruciform, is eliminated. A mid-drive design moves the drive line at the bottom bracket away from the optimal position but I think this can be compensated by a longer spindle length. With my trike, there are at least a couple possible locations for a mid drive. In the first diagram it keeps the belt below the cross tube and out of the way of the seat and handlebars. 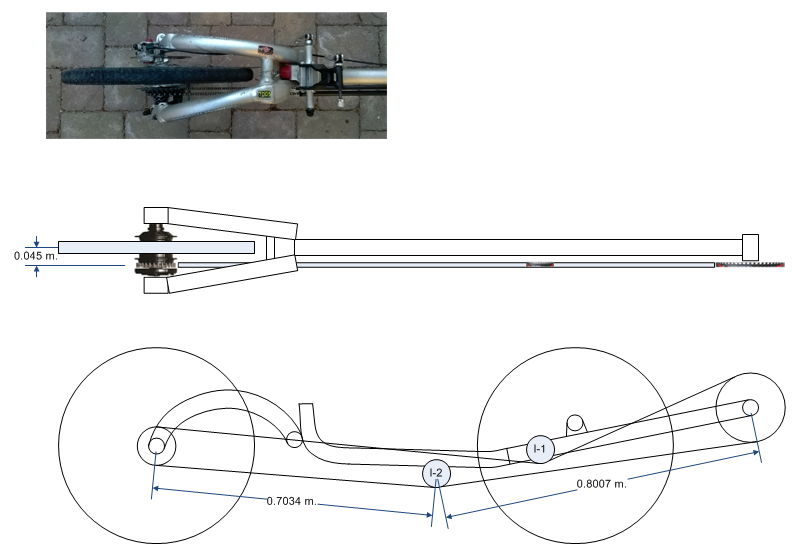 The location in the second diagram has the advantage of being mounted directly on the frame tube, which should be easier to fabricate, but greatly complicates the cockpit area by running a belt through it. At least with a tensioned belt, it won’t be flopping around and shedding oil. Still, the best bet seems to be a single belt with idlers and no mid drive. The Gates documentation dedicates an entire section to the importance of frame stiffness. Recumbents may be particularly vulnerable because the frame is so long and the boom is often cantilevered out from the main cruciform. Flex can cause the belt tension to decrease, leading to skipping and possible derailment. Gates offers engineering consultation to frame designers for this and other design issues. This points to another reality of belt drive: because of the unique requirements placed on frames, belt manufacturers really only want to talk to bona fide bike manufacturers. The rest of us have to rely on the bike manufacturers whenever they decide to bring belt drive to market, or whatever information the belt drive manufacturers release directly to consumers. Which in the case of Gates is quite a lot, actually. It’s possible that frame flex alone may be the real deal killer for belt drive on recumbents. I can actually see my boom flex when I crank on the non-drive (left) side. Combined with a hard right turn a belt might be in trouble. An interesting future investigation would be to quantify the flex on my frame and compare with the Gates specs. Even the best rear suspension design runs the risk of belt shrink or growth, causing fluctuations in belt tension. Common ways of managing it, like spring loaded tensioners, are specifically not recommended by Gates (at least). Somewhat surprisingly, Gates doesn’t rule out suspension with their belt drive system but does relegate the design to direct consultation with them. I don’t have a problem with this—I’m leaning away from suspension on my next trike anyway. But companies like ICE that have made full suspension a big part of their offering might not be too keen on a new technology that complicates that story. Unlike a chain, a belt can’t be “broken” to get it around the chain or seat stay tube of typical frame designs. This makes belt drive incompatible with these frames. A common solution is to provide a coupler like the S&S coupler in the tube that requires the belt to pass through it. Frame manufactures provide the coupler as part of a belt-ready frame design, I doubt it would work to retrofit a coupler into an existing frame (but I haven’t looked into it). My current trike has a more elegant, if accidental, solution. Ignoring for the moment that it was designed to provide rear suspension, the arched rear section of Trice Q era trikes is inherently belt friendly. No chain stay to break. Suspension aside, I have to admit I was a little sad when I learned that ICE was going back to a conventional braced rear section on the new (and current) line of trikes. The arch was unique and I thought looked pretty cool. Function combined with aesthetically pleasing form—that’s engineering gold. Unfortunately the shortest belt in my calculations, either of the mid drive configurations, is longer than the longest belt currently offered by Gates. About 1650 mm vs. 1452 mm. The single belt configuration requires around 3349 mm, more than double the biggest size available. I’m not counting the 2000 mm tandem belt offered by Gates because it has different pitch. I don’t know if there is a design limit for belt length or if there just isn’t any demand for longer belts, but this would seem to shoot down hopes of conversion to belt drive any time soon, at least with the Gates system. Update: Gates has a line of industrial timing belts called PolyChain that run as long as 4480 mm. Certain versions of these belts are constructed nearly identically to the Carbon Drive belts and seem to be their very recent predecessors. At least one person is running this system for the synch drive on their tandem. With this information I’d say it’s not likely a design limitation that’s preventing the development of longer belts. Also note that on a quick glance it seems it may be possible to satisfy both the single belt and mid-drive configurations with the lengths available with PolyChain. Might be worth some further investigation. I suspect the biggest reason we don’t have belt drive on production ‘bents today boils down to the difficulty and poor economics of producing large, custom belt lengths. Typical recumbent designs require this to cover various leg lengths. But my understanding of the Gates manufacturing process is that the belts are formed as a complete loop from a contiguous mold rather than cut to a specific length from a spool of belt and then spliced into a loop. There are undoubtedly ways around this, I talked about a few, but this constraint combined with low production volumes in one of the smallest niches in the universe of human powered vehicles might make adoption of belt drive in recumbent trikes very slow indeed. Belt Drive for my Trike? The modular three-piece frame design provides an easy way to take up slack when installing the belt or making small adjustments in leg length. ICE puts about a 6mm right offset in the rear dropouts to allow the rear wheel to be built with the rim centered between the flanges, eliminating the need to dish the wheel. This partially compensates for about a 4mm left offset introduced by the Di2 version of the Alfine-11 hub. The result is very close to my current 45mm drive line. Another simplifying assumption was to limit the exercise to a Gates belt drive with Alfine-11 Di2 rear hub. This turned out to be a huge simplification because Shimano/Gates currently only offer one choice for front and rear cog and belt type. CDX CenterTrack belt (as opposed to their CDC MudPort line of belts) and 50/28 tooth cogs. 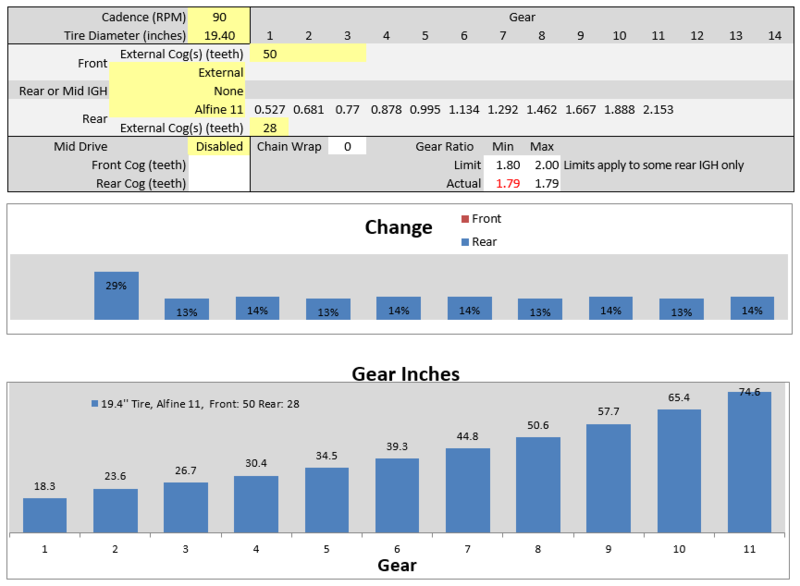 The gear inch numbers for this setup should look familiar to anyone who read my gearing post: the 50/26 combination provides almost exactly the same range as the 32/18 combination I was looking at. This isn’t too surprising as it sets the gearing at the load limit specified by Shimano for their Alfine-11 hub. Gates makes a lot of claims about the benefits of belt drive. One of them is fairly easy to evaluate right now: weight savings. Comparing a single belt Alfine-11 Di2 configuration with an equivalent chain setup, it looks like belt drive is about 200g lighter, before accounting for the weight associated with mounting a second idler. So maybe a wash, or a little heavier for belt drive. I can live with that. Clean – No Lubrication means no greasy build up of dirt, keeping your hands, clothes, and children clean. Smooth – The Carbon Drive system eliminates the metal-to-metal contact of chains, delivering an unparalleled smoothness that you need to feel to believe. No Noise – The Carbon Drive belt is virtually silent in most riding conditions. Light Weight – the entire system, 2 sprockets and a belt, weighs less than just a typical chain. Life – Testing has shown the Carbon Drive belt to last more than twice the life of chains. If true, some of these benefits, like Clean, Smooth, No Noise, and Life are potentially more of a benefit to a ‘bent than an upright due to the bent’s long and unwieldy chain. Note that their efficiency claims aren’t “more” or even “the same”, but “constant.” I’m curious what that translates to in actual use but would be willing to give it a try. And it looks like the weight will be about a wash compared with a chain. Will the belt tolerate a roughly 30 degree backward bend around an idler on the drive side? What shape of idler would keep the belt on track? What are the requirements for making belt drive work with rear suspension? Has Gates ever tested a typical recumbent frame design (long with cantilevered boom) for stiffness? I’d probably save for another day the obvious marketing question: Will Gates ever see enough market for really long belts useful only for recumbents? Belt drive for recumbent trikes is compelling enough and feasible enough that I’d imagine manufacturers have at least done some preliminary legwork and engaged with a belt manufacturer. I’d love to know how those conversations went. Considering how long belt drive has been commercially available, it may not be a good sign that I can’t seem to find even one recumbent manufacturer talking about it. I wonder if any trike designer has ever considered a front wheel drive tadpole. This might make a standard bicycle belt usable, eliminate the drivetrain bend issue, and maybe help with the leg length/tensioning problem. driving both front wheels would be more complicated, and there may not be enough weight on the front to allow one wheel drive to work on anything but dry pavement. Isn’t this common in engineering; solve one issue and create a dozen more? Gates doesn’t currently make a belt even half as long as what I’d need for the “single belt” solution I described. I’m curious if another manufacturer (Schlumpf?) uses a splice fabrication process instead of a mold, so that belts could be easily cut to any random size. I’ve heard of front wheel drive delta’s but not a tadpole. That would eliminate one of the big benefits of a tadpole which is a simple and standard (though long) drivetrain. But yeah, long may be a big problem for belts. Here is an idea you’ve probably thought of: Use the suspension pivot point on your old Trice Q as the belt tensioning device. Remove the suspension puck, and modify the pivot to accomodate a finely tunable rachet that spreads or closes the pivot to move the rear axle position fore and aft. One problem with this might be that there would be a LOT of pressure on this mechanism, even before the rider sits down on the seat. But it might be doable. This might allow a bit more range in the leg length adjustability in the front tube. A variation on that is to fix the pivot so it’s no longer suspended, to solve _that_ problem. But I suspect either one would put too much force on the pivot to be practical. With a different pivot design, though, your idea is pretty interesting. Couldn’t you just do it with two belts (isn’t that what tandems do?) the drive belt in front to a hub under the seat which in turn runs back to the rear wheel. It’s an extra piece but it would also let you split the frame in half when you need to. I switched to a Gates drive/Alfine 11 on my traditional commuter (Spot Wazee) a bit over a year ago and am coming up on 10,000 trouble free miles… it lives up to the hype, especially through the winter. Andre, thanks for the feedback. Yes, I talked about using two belts in the mid-drive option. As I recall (it’s been awhile since I thought about this) even with two belts, one of them is longer than the belts typically used on two-wheelers, but it definitely helps. I concluded that the bigger problem was boom flex with the cantilevered front crank on tadpole trikes. But since then, the even bigger problem is that I dumped my Alfine-11 after it failed on me early in life, concluding after discussions with Shimano that it really isn’t up to the task. However I know several people like you who have many miles on their Gates/Alfine-11 bikes, and love it. It really is a great solution when all the pieces work, glad its working out for you. It is November 2016 and there are reports that Gates is introducing a 158 tooth and a 168 tooth CDs belt with the 11 mm pitch. Using 28 tooth sprockets this would give .781 meter length between axle and mid drive. The parts don’t show in the catalog yet. I was thinking of using 3 belts, which is about how much chain I have on my trike. Of course, that’s more complexity and more weight. It’s been a while since I looked at this, I wonder if they offer longer belts now. They were pretty close to what I calculated needing for a 2-belt solution. I think I’d exhaust that possibility before going down the 3-belt path, for the reasons you mention. The new length Thomas mentioned above is getting really close, and might be enough for a shorter frame than mine. 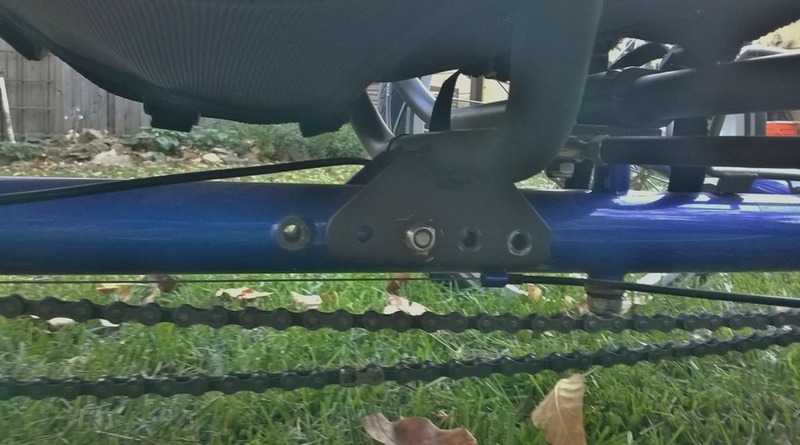 I was just thinking that the chain on my trike is about 3 bike chain lengths. My other thought was that it would be possible to make a shaft-driven trike, though modifying an existing trike would be more difficult. It would be possible to make a shaft with a bevel gear that can be moved to adjust the effective shaft length. Gates is launching an even longer belt, a 174t; Q3 2017 which is now or likely at Eurobike at the end of this month. The combination of shaft drive and belt drive might also be interesting, since one way or another the drive will have to ‘bend’ in the middle. Boise’s fleet of rental bikes use shaft drive, have been meaning to take one for a spin to see how it works. I wonder if anyone has experience with a CVT for bicycles or trikes? Nu Vinci has a new one lighter and smaller than previous at 5.4 lbs. Drive it with a belt and it becomes somewhat competitive in weight to the standard derailleur system. NuVinci works with belt drive, would be a good choice now that they’ve got the weight down. I have some friends with belt-driven Nuvinci 2-wheel commuter bikes, will have to try one out sometime. Of course it doesn’t solve any of the (above) issues running belt drive on a recumbent. And now that I’ve experienced electric shifting, downgrading to a mechanical 2-cable shifter is a deal-breaker for me. The NuVinci drive requires only one cable to activate the driving balls in the mechanism. I’m curious about the electric shifter you mentioned. Is it significantly better than a lever or twist shifter? In what way? If the battery goes dead can you still shift? I’m wrong. The NuVinci is a two cable device. The ergonomics of the push-button Alfine shifter I use are significantly better than a twist shifter, particularly on a vertical handlebar on recumbents like mine. But even on a conventional handlebar the activation effort is less than a twist or trigger shifter and the shifting is far quicker and more accurate. And within the same maintenance interval that would have me lubing or replacing mechanical shift cables to fix degraded shifting (about 3 months), my di2 shifting is as crisp as the day it was installed and requires a simple overnight charge to keep it going. In two and a half years now I haven’t had a bad shift, still on the original battery. My ongoing battery performance is here: https://seasonalcommute.com/di2-battery-life/. Other di2 information and impressions throughout this blog. When the battery dies you’re stuck in one gear, though if you wait a few minutes you can get a final shift through all the gears to pick the best one to get you home (I’ve tested this only twice). But the system is reliable and predictable enough that it’s very unlikely the battery will just die on you, assuming you have a good battery to start with (there is evidence that Shimano released some defective batteries a few years ago, but that sort of problem should reveal itself pretty quickly). All that said, I suspect shifting on a 2 cable CVT like Nuvinci will degrade slower than a conventional external derailleur. With belt drive, the only electric shift options I’m aware of are Shimano Aline and (maybe) Rohloff.